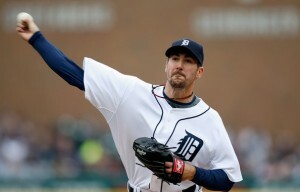 Justin Verlander and the Detroit Tigers are are looking to complete the 2009 playoff picture. The first few weeks of October are always great sports weeks as between the Major League Baseball playoffs, college and pro football, the NASCAR Chase and the starts of hockey and basketball seasons there is more than enough to keep every sports nut happy. While we have known most of the teams participating in the playoffs for several weeks. The Minnesota Twins and Detroit Tigers have kept things interesting in the AL Central. Even if Minnesota doesn’t make the playoffs, they should get credit for doing more with less than any other team in baseball. Now that the Oakland A’s have hit the skids the last couple years, the Twins have emerged as the most consistent contender among the teams generally seen as the “have-nots” in baseball. Remember at the start of this decade when the buzzword was contraction and many thought the Twins should go? With their new park scheduled to open next year, look for the Twins to remain competitive. Of course, a new stadium doesn’t necessarily guarantee that you will be competitive on the field (just ask fans of the Pirates and Reds), but for a management team that is among the best in the league, the potential of having more resources could make them really dangerous.